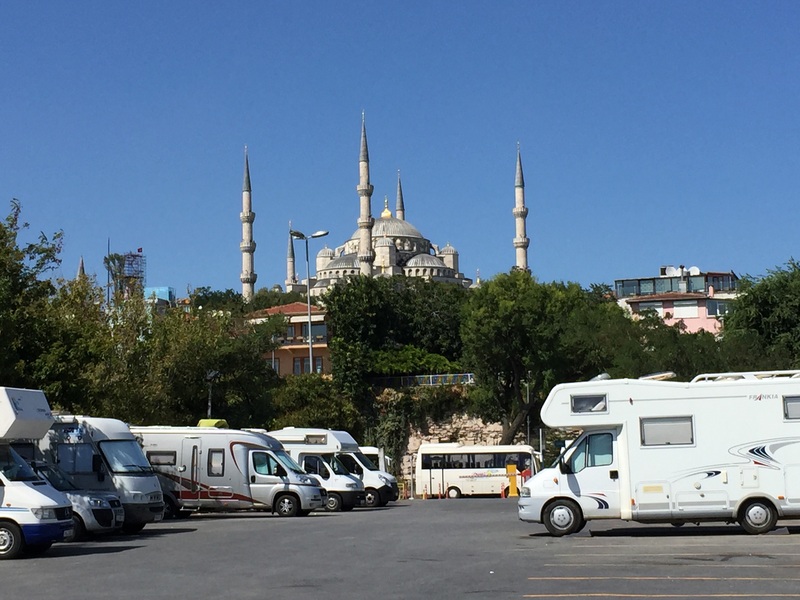 We give the Hymer a quick vacuum, serviced the usual and head for Istanbul. 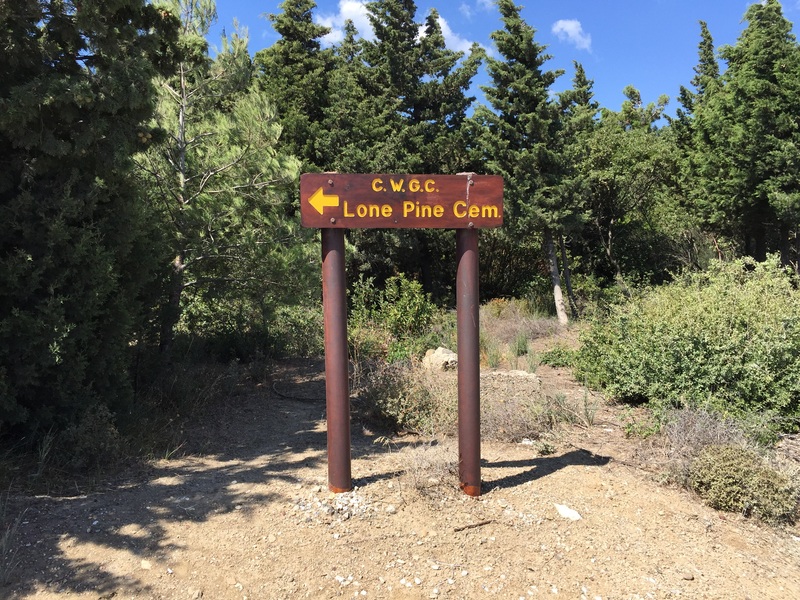 According to the GPS it should take about an hour, however 2.5 hours was closer to the mark. Once we hit the motorway the traffic picks up quickly. Trucks and more trucks, it’s all fairly polite but where are all these trucks going. About 10 klms from the old city the traffic grinds to a holt, the next several klms are at a walking pace. We not in a hurry, so no need to panic yet. Finally we approach our park to find the access ramp closed for repair, things rapidly turn to custard. We make our detour through a series of narrow lanes. At times it was chaos, but the Turkish people are generally very helpful and more than once a shopkeeper came out and gave us a guide around a tight corner. Anyway we made it without a scratch, only problem being Pam’s hair colour. Our digs in Istabul, just a secure carpark, but a great location. 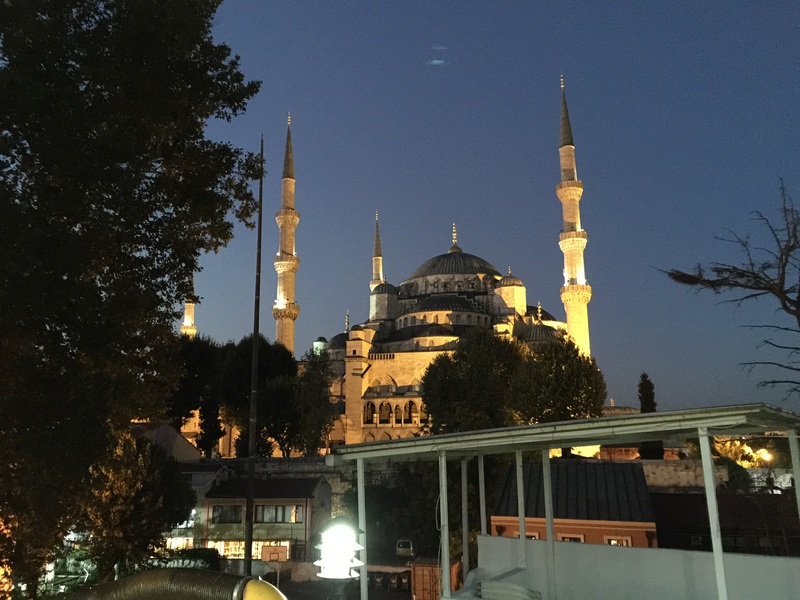 Just up the hill to the Sultanahmet (Blue Mosque). It was a noisy place with cars coming and going all night plus the odd dog barking away. 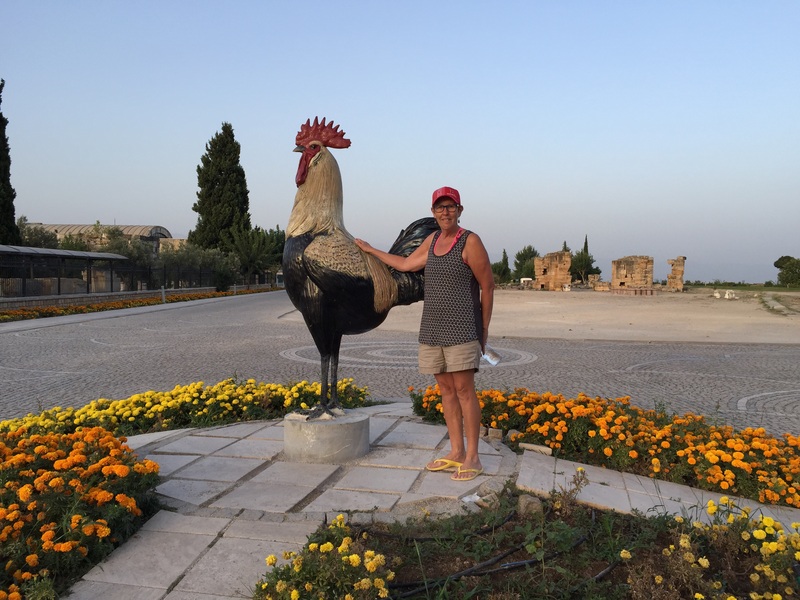 But the ten minute walk to the Old City is much better than an hour on the bus from a campsite on the outskirts in our opinion. View from the opposite side, The Bosphorus. At TL30 every 24 hours, it good value at A$15 a day in our opinion. My sister Wendy is concerned Pam may not be enjoying the rough and tumble of campercar life without regular retail therapy. 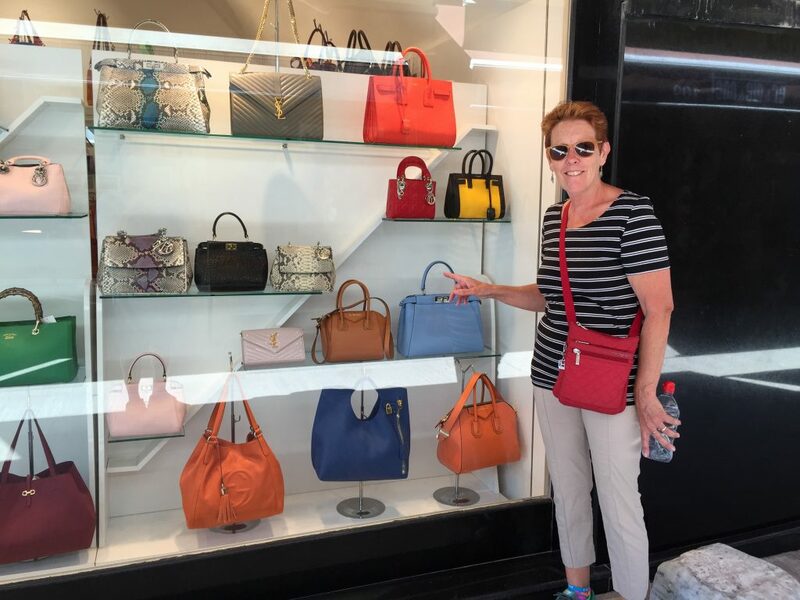 Pam didn’t buy anything but I did let her look for a while. 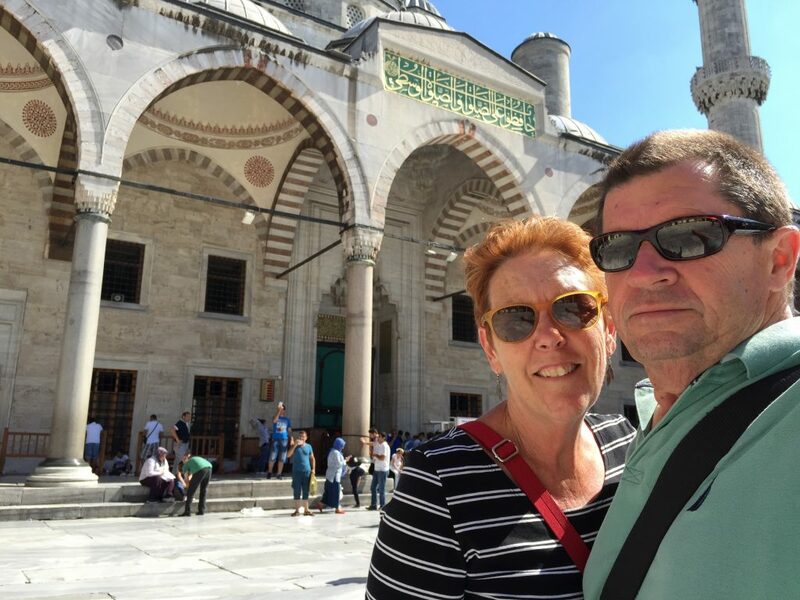 Our first afternoon was a visit to the Sultanahmet or Blue Mosque. To be honest we were a bit under-whelmed. From the outside it’s a large and very complex building with its beautiful domes and minuettes. But inside it was very dull and drab. We thought more a grey than blue. The Blue Mosque again, it was our first time in a mosque actually being used. The faithful were coming and going as we wandered about carrying our shoes as we didn’t want to leave them at the door. The attendant very kindly gave us a plastic shopping bag to carry them about. Trying to catch a little blue. 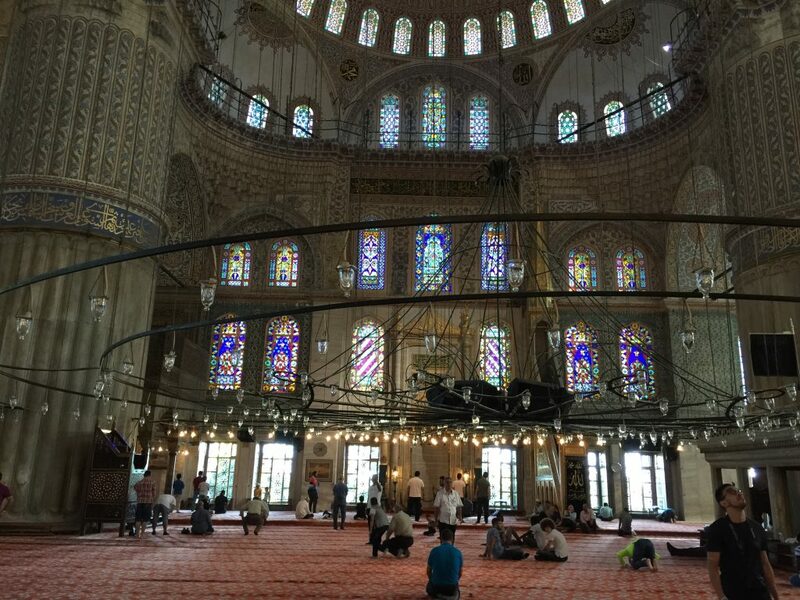 The lighting in the mosque seemed unusual, but as we have now visited several, it seems to be the traditional method. A huge iron chandelier hanging from hundred of wire traces. 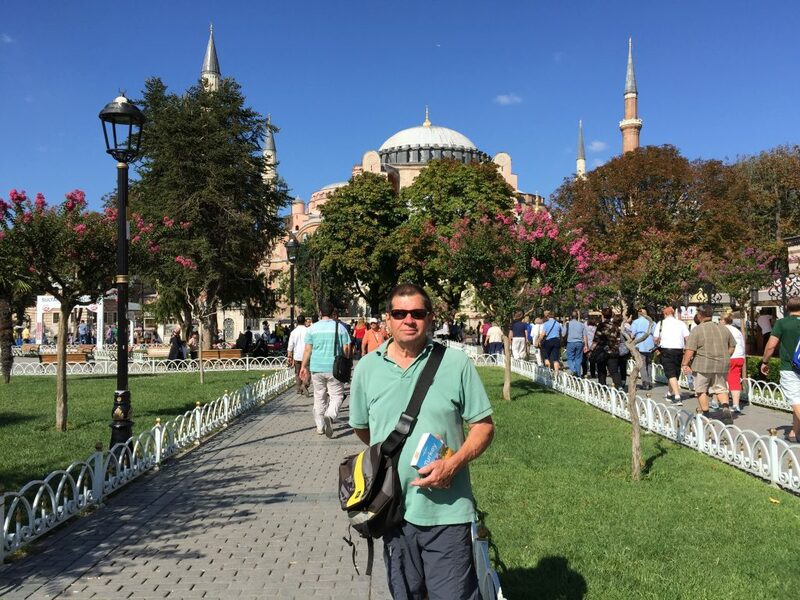 The garden between the Sultanahmet and the Aya Sofya (behind) are a beautiful contrast. Every time we passed local families would be sitting about as the tourist streamed by. 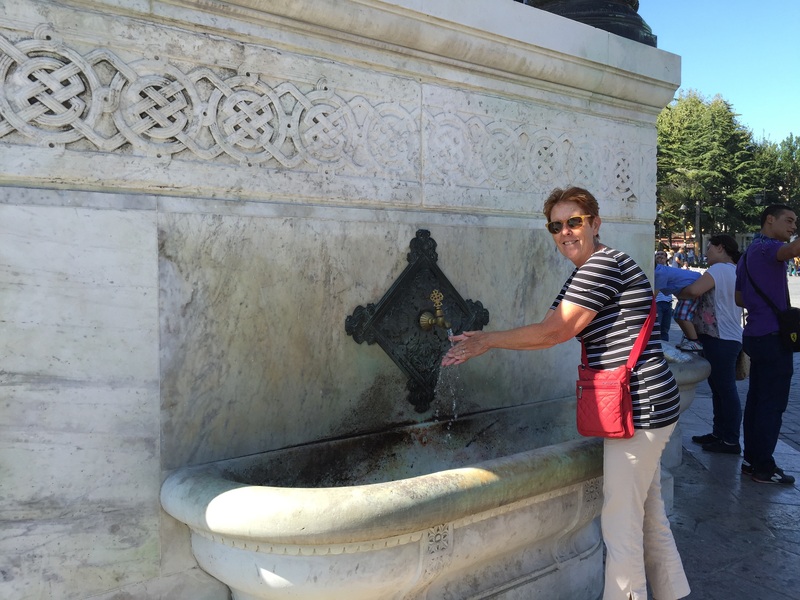 Pam rinses out a few things in the gardens of the Sultanahmet. 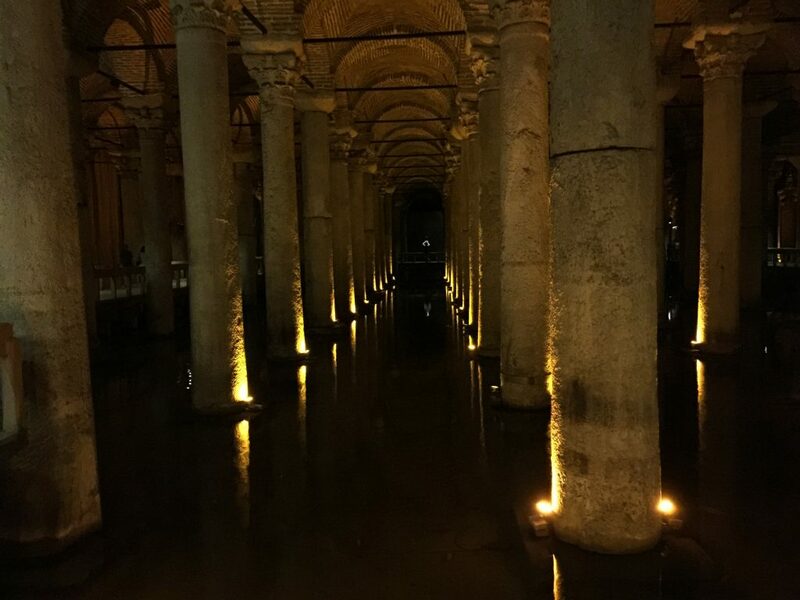 We visited the Basilica Cistern in the late afternoon of the first day. 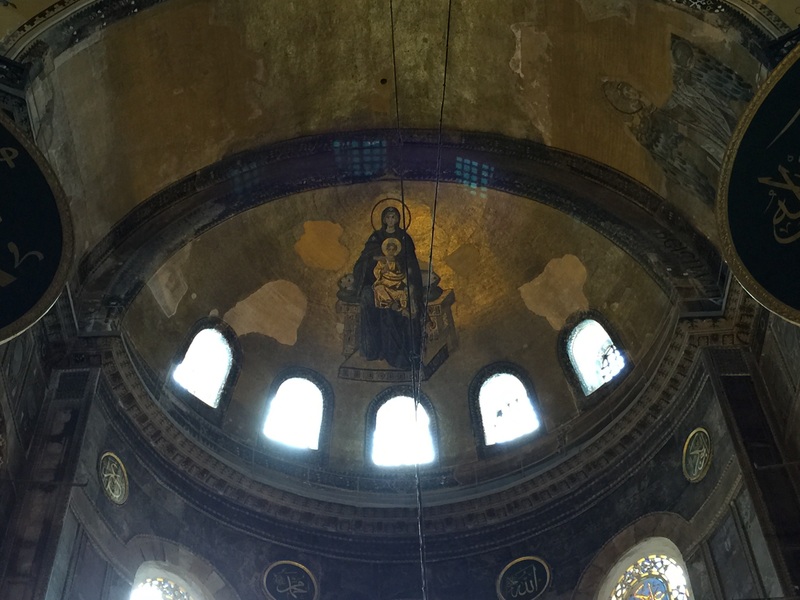 Apart from being lovely and cool, it was an amazing structure built adjacent and underneath the Aya Sofya. Built in 532 AD it has stood the test of time obviously. It’s now a big fish pond with huge fish swimming around in the twilight. The base of this column is a large carving of the Medusa’s Head. 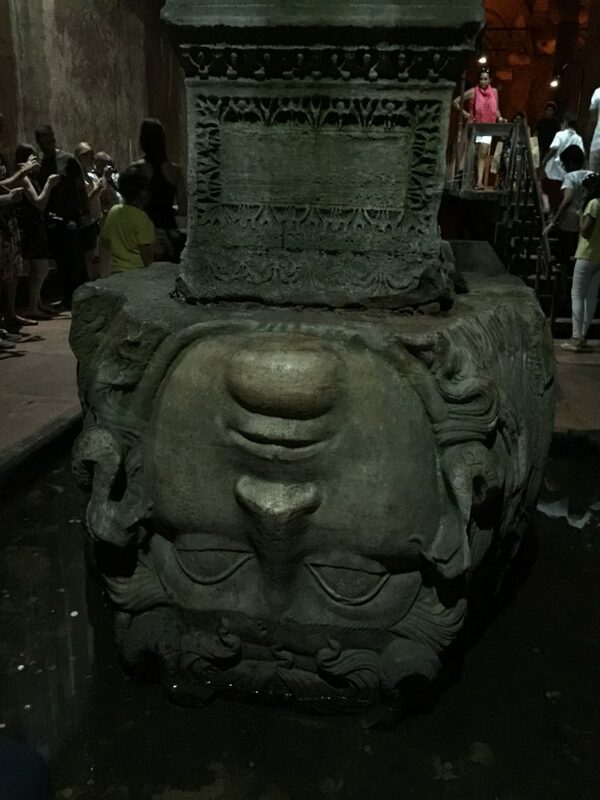 The mythology being the head cannot come back to life if held upside down. There are 336 stone columns in the cistern. 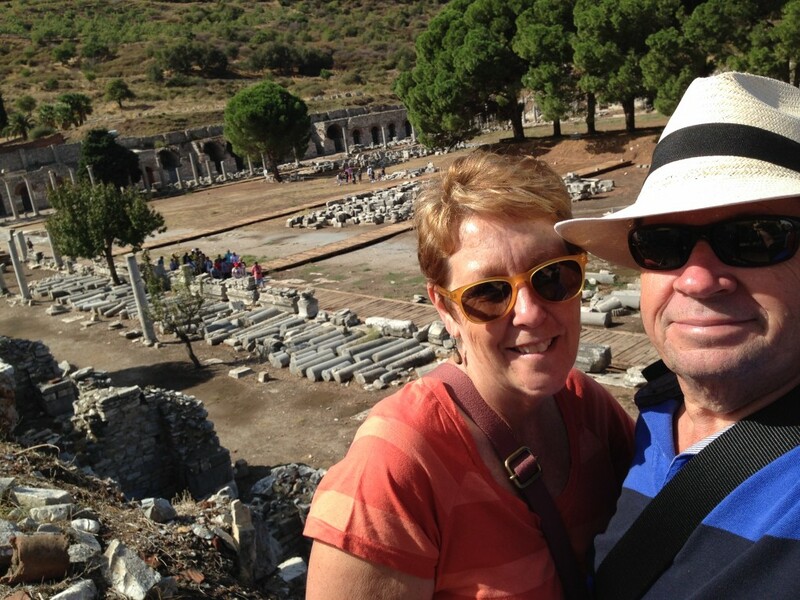 Interesting the builders utilised used columns for the project, apparently brought to Istanbul from all over the relm. The iPhone 6+ takes quite good pictures in low light doesn’t it ? Found this by chance whilst looking for a cool spot to sit down. 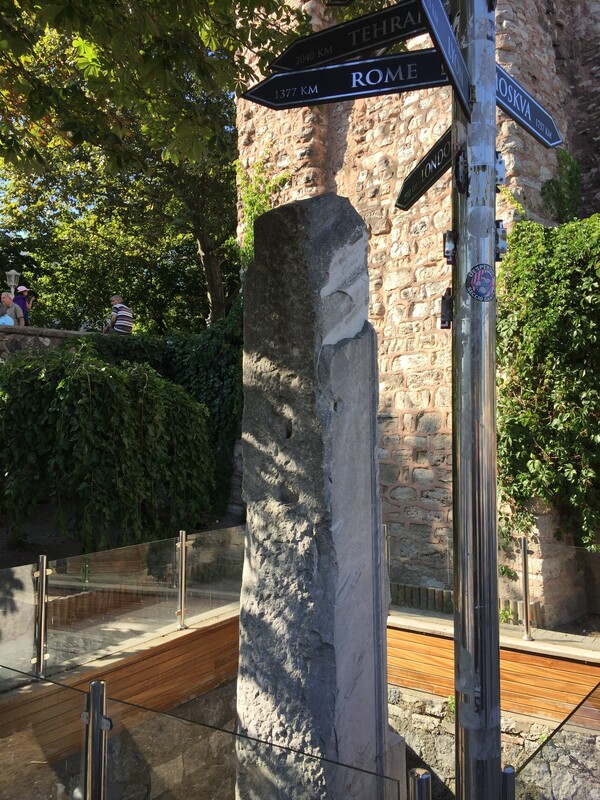 The centre post of Constantinople, from this small column the Romans and Byzentines measured distances all over their empires. 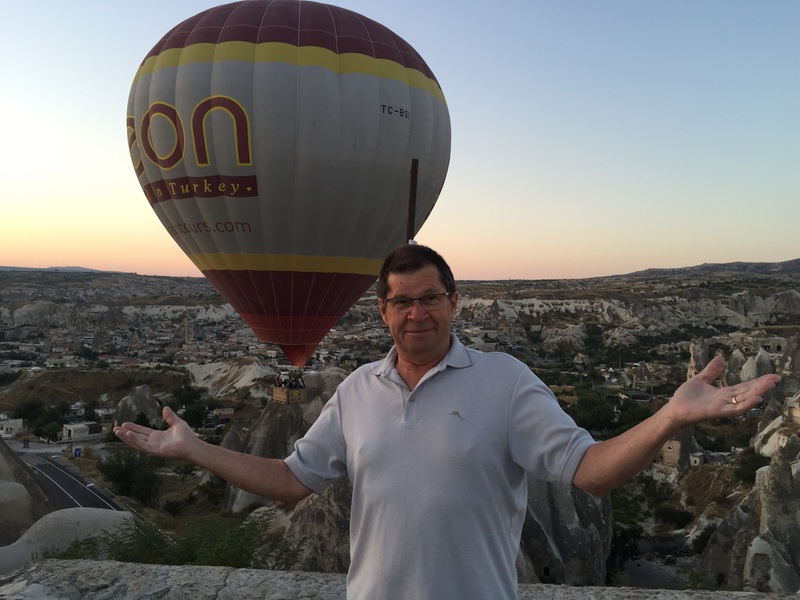 Interestingly when I used google map to create the map above this photo, the drop point is exactly were this column sits just across from the Aya Sofya. 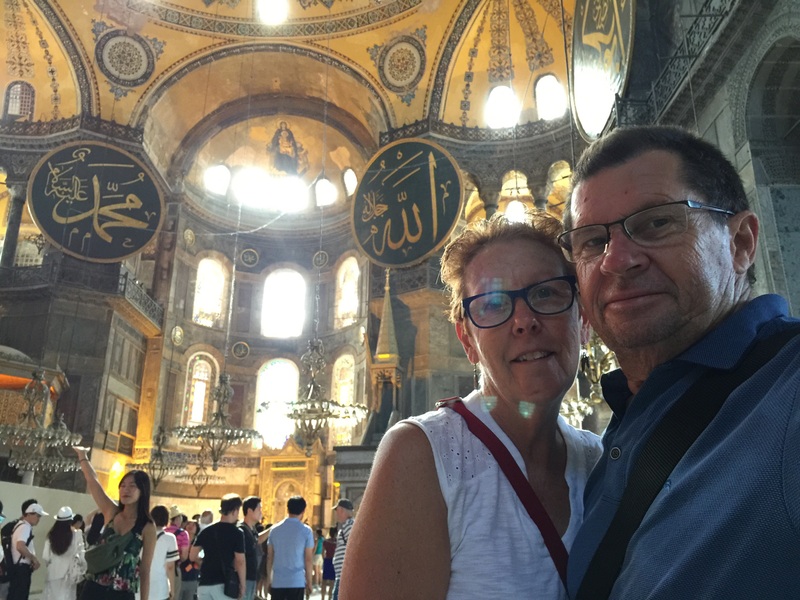 On our second day we visited the Aya Sofya, I am using the local Turkish spelling at it appears on the direction signs in Istanbul. It is everything. Picturesque on the outside, visually impressive on the inside. 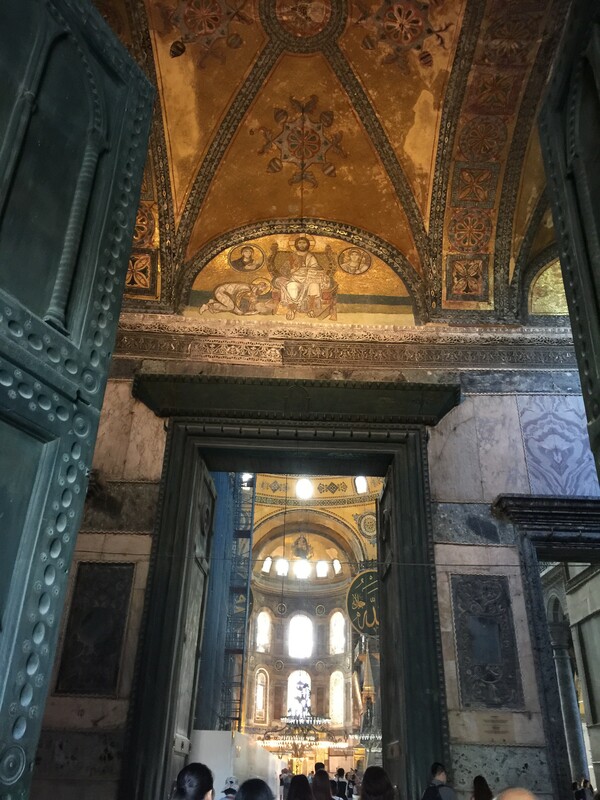 The outer nave and its fresco of Jesus. 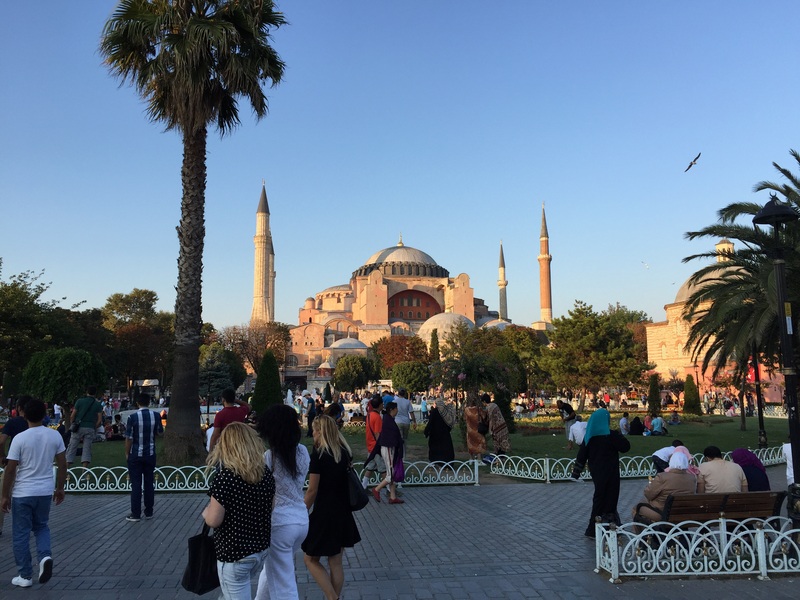 The Aya Sofya was decreed a museum by Mustafa Kemal, the hero of Gallipoli and later President of Turkey. 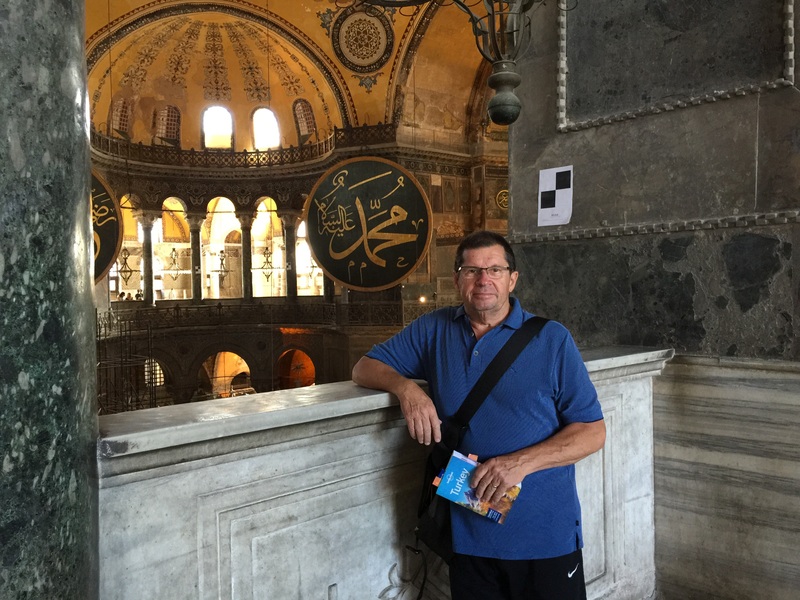 As a museum the Aya Sofya retained both its Christian, Byzentine and Islamic heritage. The Otterman Medalians in contrast to the Christian Mosiacs. This fresco of The Virgin and Child one of many mosiacs and frescos date to the mid 5th century. Overlooking the lower gallery, Lonely Planet in hand. A good travel guide pays for itself many times over. Not just in what and where to visit but how to get there, the cheapest entry passes and what bus to catch. For us how to by a toll pass for the motorways was a big help. One of the two ramps providing access to the upper gallery. Ramps rather than stairs, give you an indication of the size of the Aya Sofya. The feet who have passed by in 1500 years, something to ponder. 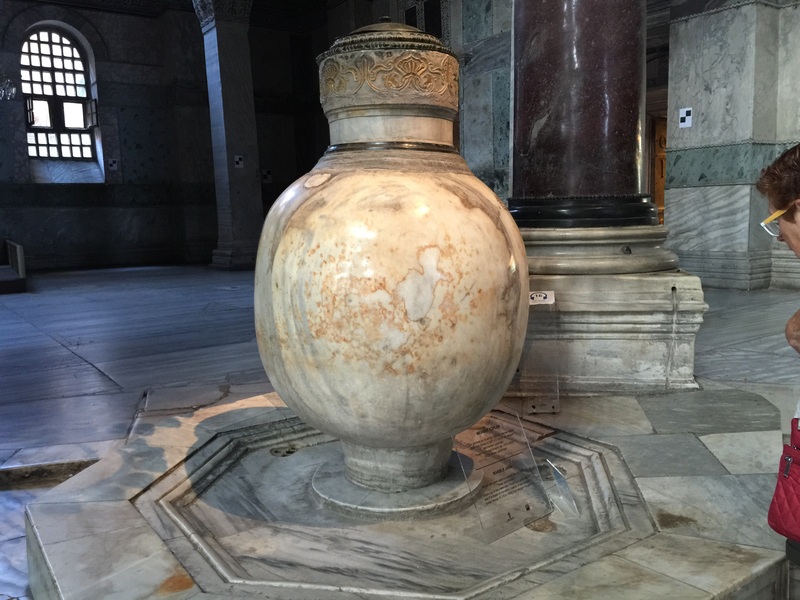 One of a pair of marble water vessels, used to hold Holy or Sacred Water for use in its previous life as a place of worship. 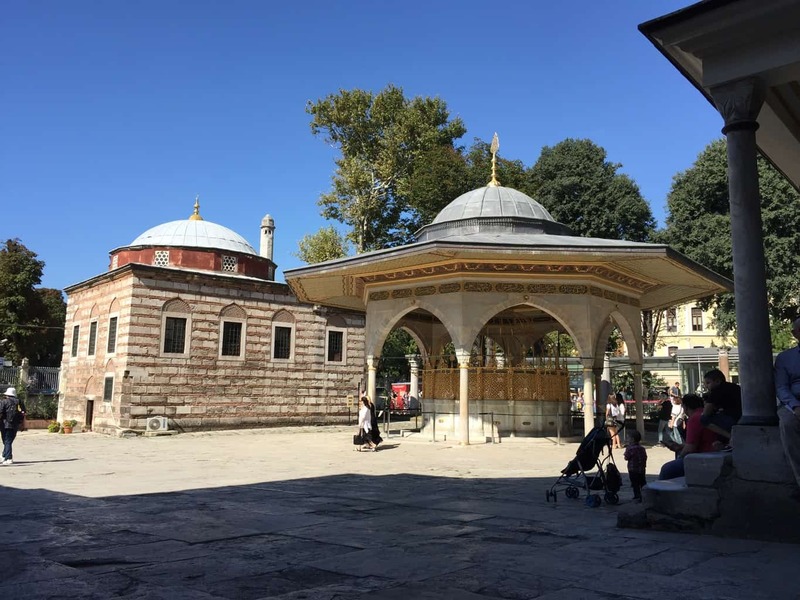 The Aya Sofya Tombs, hidden behind, with a seperate entrance and fees are the less visited tombs of the Sultans. No, the whole family is not scattered in felt covered coffins around the tomb. The felt casket sits above the the internment point. 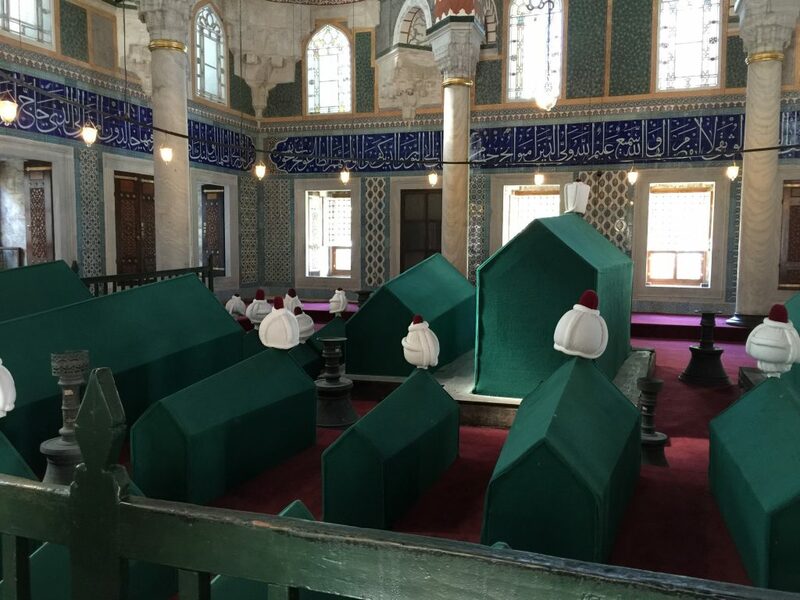 The Sultan and his sons all have these white turbin style markers on there caskets, nothing for the girls. There are many children caskets amongst them. We thought if the infant/child mortality rate was that high for people in a privileged position, imagine what it was like in the common community. 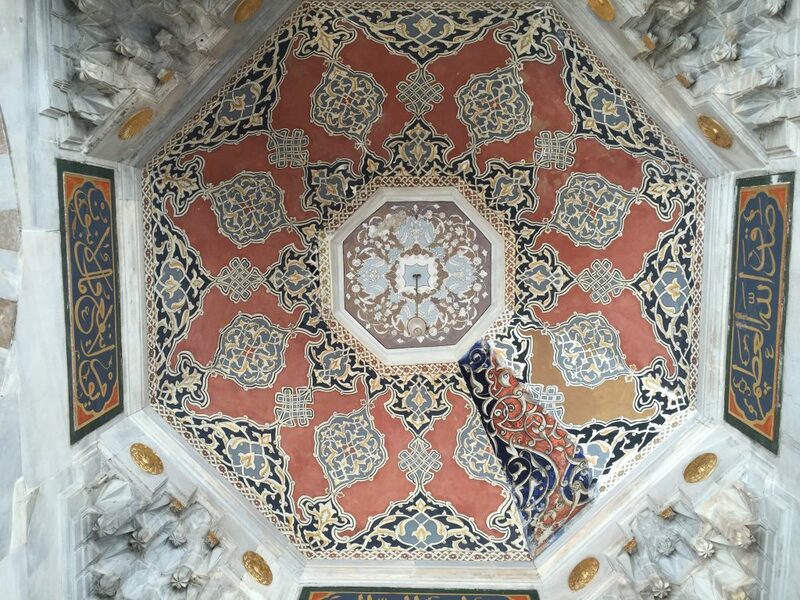 The ceiling of the tomb. We don’t know what was happening but one quadrant was different as if it had not been restored, but the pattern was different. Just another of life’s mysteries. Believe it or not we have not scene a Maccas since Italy. That’s more than 1,500 klms, we keep an eye on out for them and sneak in for the free wifi. 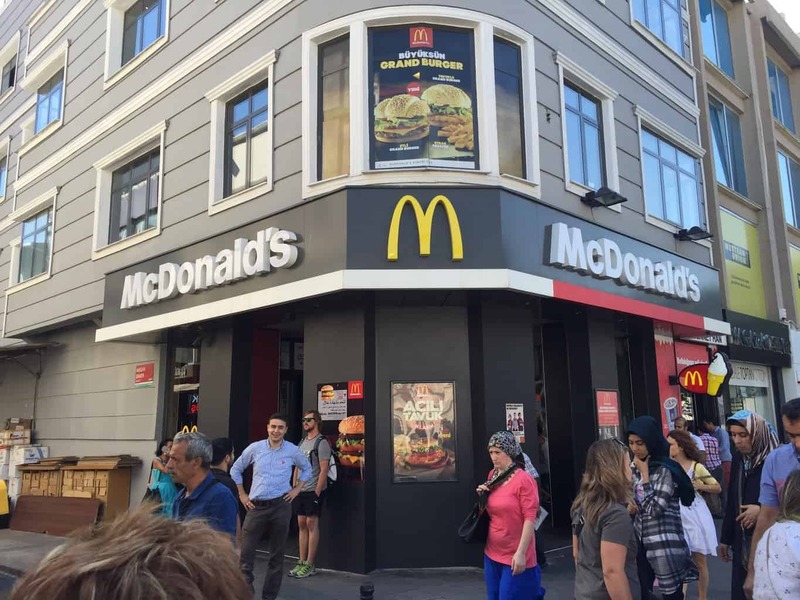 There are 3 in the Old City about 500 metres apart, near the 3 main tram stops. Could not get bacon on my McMuffin though. 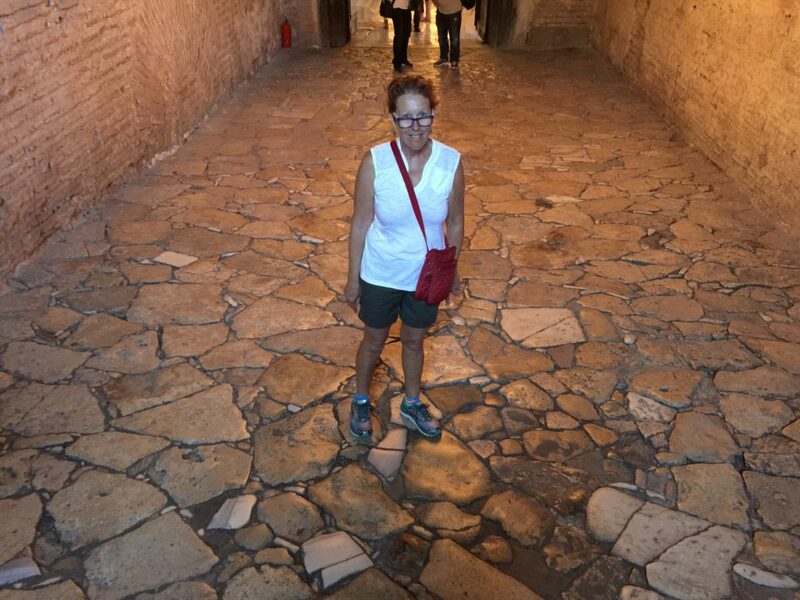 After visiting the Tombs, Pam said she needed a steam and a good massage. 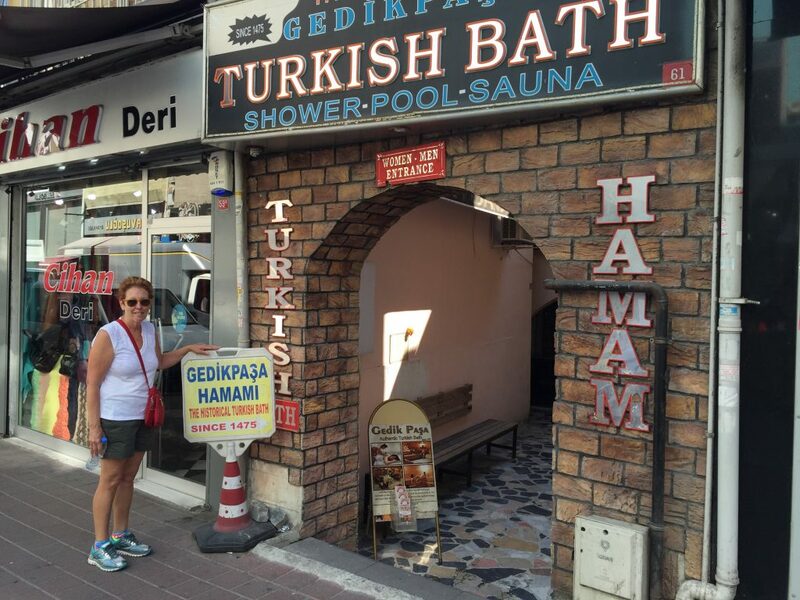 So we headed for the Hamam. It was quite an experience, I felt like I had been beaten up, Pam said she felt a little uncomfortable as she had her steam and massage with two student backpackers from Sweden. I said tell me all about it and suddenly felt a little better. 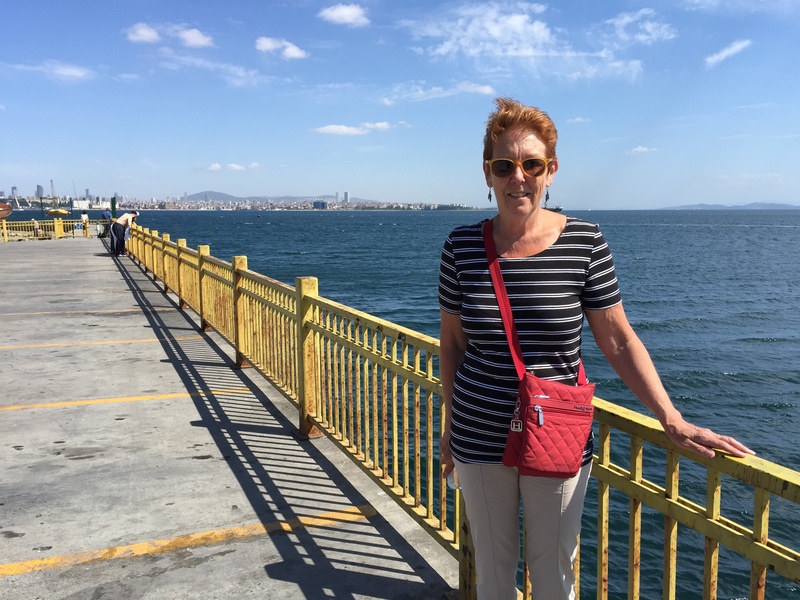 Sorry I was hoping to do Istanbul in one blog but it’s just too much ! 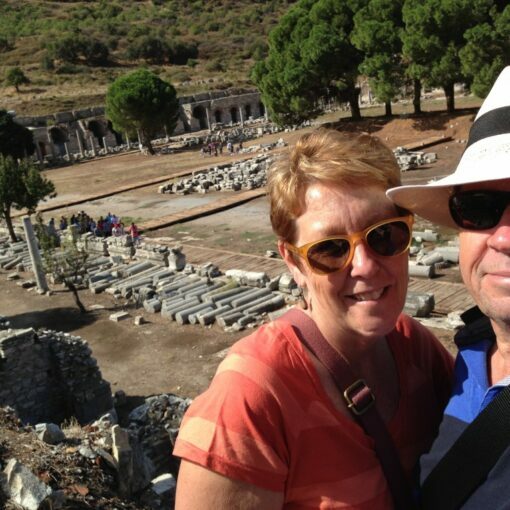 You both seemed to have followed our footsteps in the old city. 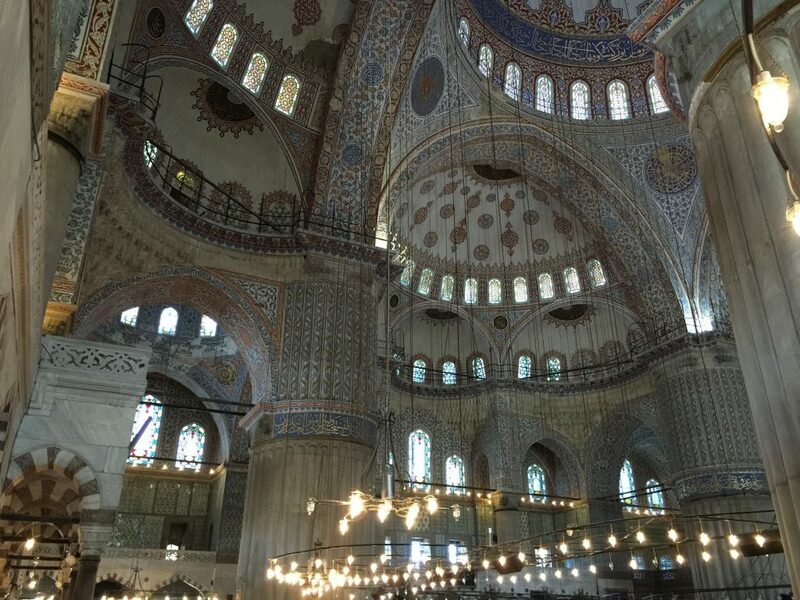 We also enjoyed the mosaics museum around the corner from the Blue Mosque with a great shopping arcade as you come out the door also a nice cafe where we sat and had coffee. Enjoy.